Blanketing the small islands of Malta are scores of archaeological sites – gigantic megalithic monuments, Bronze Age dolmens, Punic tombs, remains of Roman Villas, and the enigmatic ‘cart tracks’, a complex network of ruts gouged in the rock. For three thousand years, from about 5200 B.C., the archipelago was home to a distinctive, temple-building civilization. The huge free-standing structures date back to 3600-2500 B.C. and seven of them are listed as UNESCO world Heritage Sites. 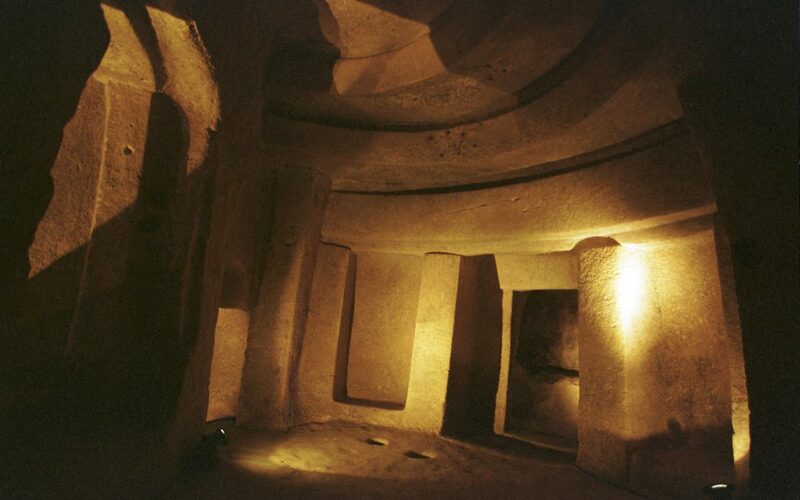 One site above all others is unique to Malta – the Hypogeum, a labyrinth of underground chambers probably used as both a burial site and a temple. Scholarly studies show that it dates back to about 4000BC, and the complex was used over a span of many centuries, up to 2500 BC. Archaeologists estimate over 6,000 people were buried within the sanctuary. This underground complex is adorned with prehistoric art, including black and white checkerboards and red ochre wall paintings, the only prehistoric paintings found on the island. And carved features decorating the chambers reflect the architectural elements seen in contemporaneous Megalithic Temples. Ħal Saflieni Hypogeum is inscribed on the UNESCO World Heritage List as “a site that bears a unique testimony to a cultural tradition which has disappeared”. Travel to Malta (as well as Cyprus and Rhodes) with Far Horizons on In Path of the Crusader Knights.